Big Apple Secrets: Reflecting Absence- September 11, 2001 memorial pools. 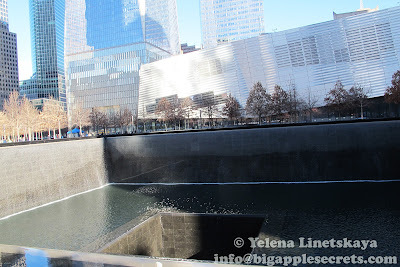 Reflecting Absence- September 11, 2001 memorial pools. The Twin Towers were the centerpieces of the World Trade Center complex. They were the tallest buildings in New York City, and for a brief period upon their completion, they were the tallest buildings in the world. On the morning of September 11, 2001, 19 terrorists from al-Qaeda, hijacked four commercial airplanes and crashed two of the planes into the upper floors of the Twin towers. The attacks killed nearly 3,000 people from 93 nations. 2,753 people were killed in New York. Ten years later, on the 10th anniversary of the attack the September 11th memorial opened. The centerpiece of the memorial, called Reflecting Absence, is a pair of pools that correspond to the vacant footprints of the old Twin Towers. Although officially described as “reflecting pools", they are not exactly pools but two subterranean waterfalls. 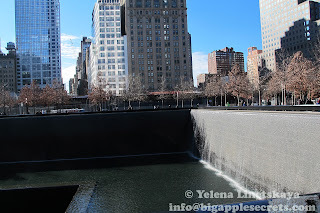 The waterfalls are surrounded by the names of all the victims of the 2001 and 1993 attacks. The two fountains together make up the nation’s largest manmade waterfalls. 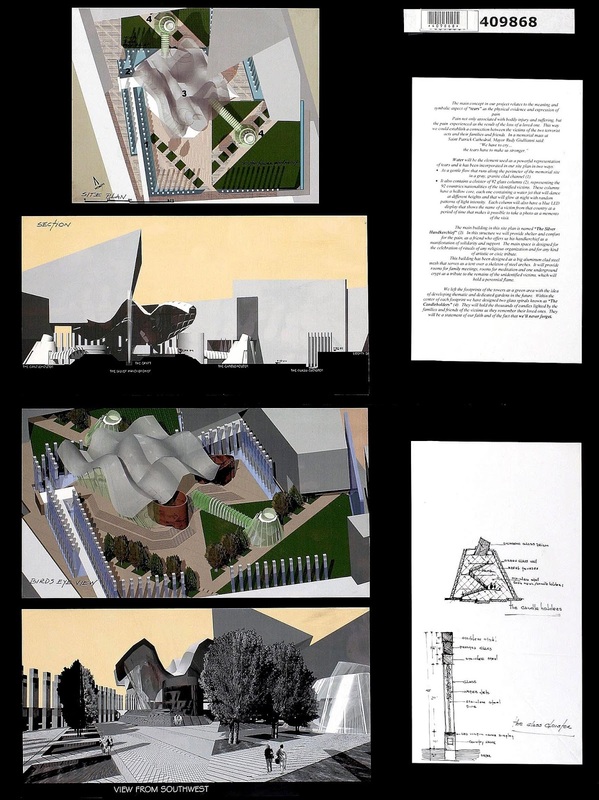 Memorial was designed by the Israeli-American architect Michael Arad, who, in collaboration with the landscape architect Peter Walker, won the competition in 2004. The competition began April 28, 2003. Invitation to Compete, signed by Pataki and Bloomberg, said: "Dear Competitors, On behalf of all New Yorkers, we welcome your participation in the World Trade Center Site Memorial Competition. This is the most significant public memorial project in our City’s recent history, and we are depending on the creative community for your vision and insight". 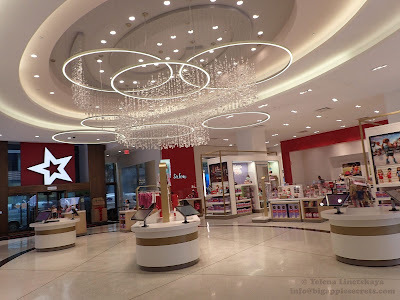 The contest garnered 5,201 entries from 63 nations and 49 US states out of 13,683 registrants from all 50 US states and 94 nations, making it the largest design competition in history. 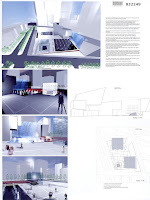 The jury consisted mostly of architects and artists. The honorary member was David Rockefeller Sr., the oldest living member of the Rockefeller family and family patriarch. David Rockefeller is 100 years now and he is the world's oldest billionaire. In 1960 David Rockefeller presented a plan for a world trade center along the East River of Manhattan. 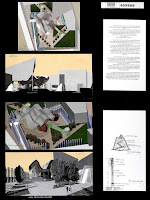 The winners Michael Arad, the Israeli-American architect and Peter Walker, landscaping designer—were announced on January 14, 2004 in a press conference at Federal Hall in New York City. In one of his interviews Michael Arad said: "I had been living in New York for about three years when the attacks happened, and I felt very much like a stranger within the city. Yet that experience, that crucible of fire, made me feel like a New Yorker. If you had told me a week before that that I would go buy an American flag and hang it out of my window, it would have seemed inconceivable to me. But that is exactly what I ended up doing." 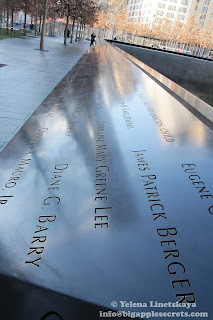 The trees that were selected almost all come from within 500 miles of the WTC complex, the rest harvested from Pennsylvania, Maryland, and areas impacted by the attacks. The swamp white oak was chosen specifically for its longevity—living, on average, 300-350 years—its natural beauty, with leaves that change to pink and gold in the fall, and its impressive height and tough nature. From the designers of the Alhambra in the 14th century to a 20th- century sculptor like Isamu Noguchi, artists and architects have used water as an accent, its gentle burbling and rippling sounds creating an atmosphere of ease and contemplation. "We haven't had any fountains this large in one place anywhere else in the country," said Port Authority Senior Engineer Edward McGinley. "There's a lot of pumps, there's filters, there's mechanical filters to take sediment out, there's UV lights that take bacterial control, there's chemical additives." A heating system will keep the water from freezing in winter and the waterfalls will be carefully regulated, particularly when there is heavy winds. The entire volume of each fountain will circulate through the system every 22 minutes. 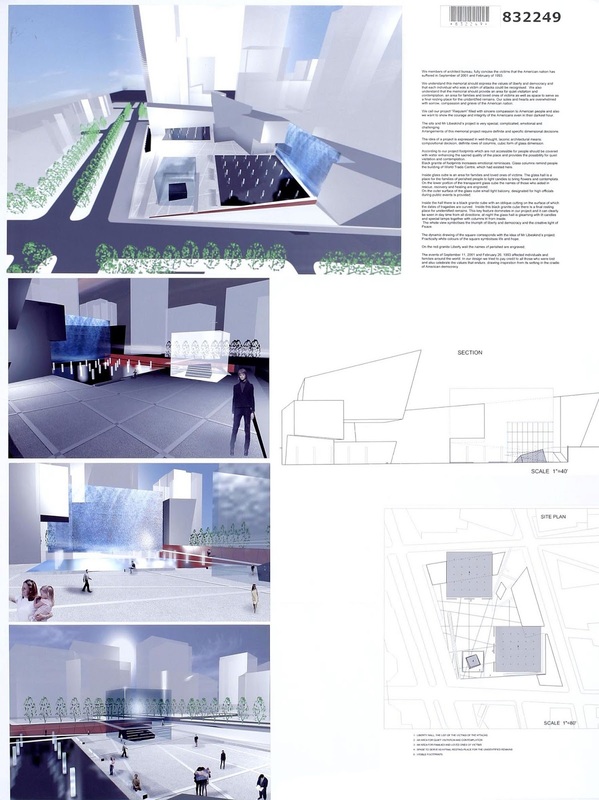 And the fountains are designed to filter out coins in the likely event that visitors toss them into the pools of water. Each day before the memorial opens to the general public, the staff places a white rose on top of the name of each victim who has a birthday. There's at least one birthday for every day of the year, and six on Sept. 11 itself. 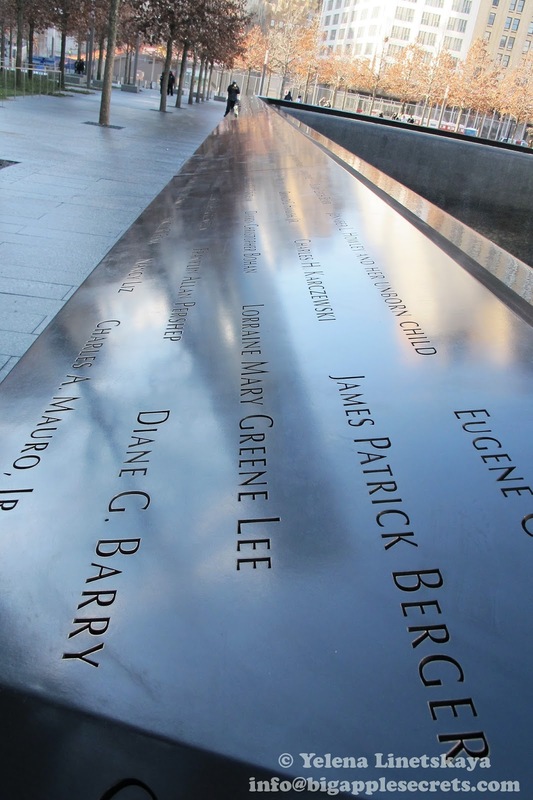 The victims of the 1993 World Trade Center bombing will also have the same honor. 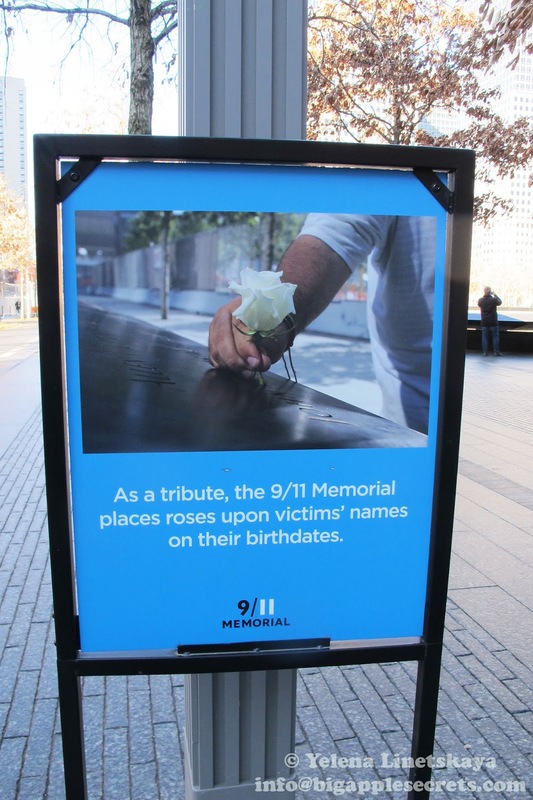 The idea came from staff and volunteers as they thought of more ways to personalize the memorial for each of the victims, said Anthony Guido, communications manager at the Sept. 11 Memorial and Museum. The birthday roses cost $2,500 a year, an expense that's built into the memorial's budget. 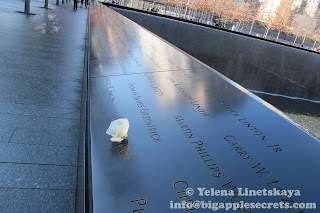 A visit to memorial is a must for any first time visit to New York City.